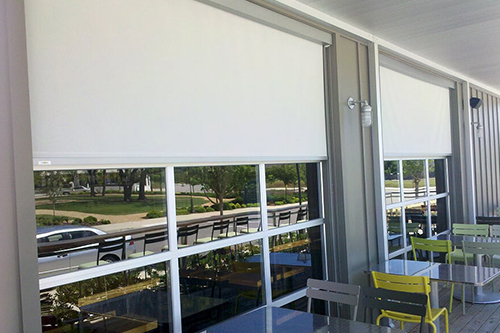 Featured Projects - Just Blinds Inc.
Ixtapa recently installed heaters on their beautiful patio. 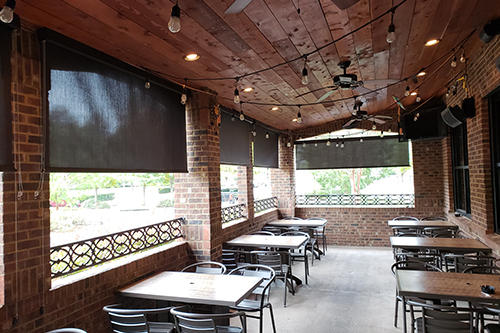 Instead of letting the heat escape from the patio, we installed exterior solar shades to help confine the warm air to the patio area. Additionally, these shades will help summertime heat and glare. This solution is year-round winner! The sun and heat penetrating the large glass doors at The Tipping Point was a major hinderance to the patrons and employees. By installing exterior solar shades, patrons are now able to relax, listen to music and watch the kids play from the large interior windows a lot more comfortably. 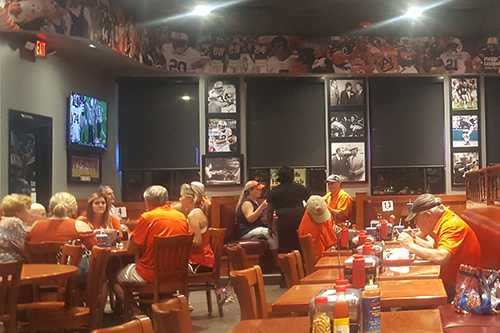 Full Moon BBQ opened a brand new location in the popular Eastchase Shopping area in 2017. A brand new building called for a cutting edge solution for keeping patrons happy – We installed 3% solar screens to the large windows. 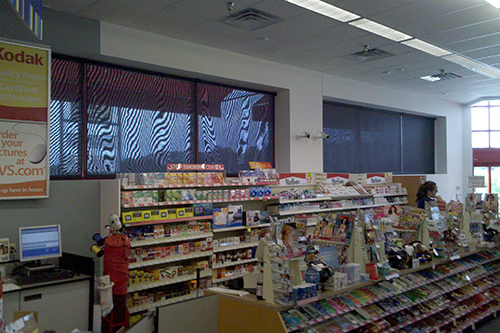 The CVS Pharmacy on Main Street in Prattville received solar shades, allowing both the customers and employees to enjoy a cool atmosphere. Alabama Archives and History had old deteriorating 2″ aluminum blinds. Just Blinds replaced with new 2″ aluminum blinds in the front lobby and offices. Additionally, 1% solar shades were installed behind closed doors to prevent damage and help preserve Alabama’s artifacts. Libraries are a safe haven for college students – a place to study and read in a quiet, dim atmosphere. 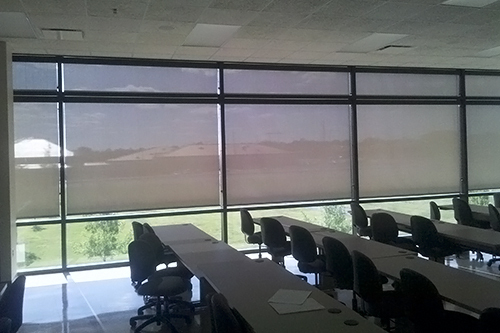 Central Alabama Community College wanted to enhance their student’s comfort levels by installing 3% Solar roller shades on the 2nd and 3rd level windows in the library. By doing so, it greatly helped reduce glare for the students. 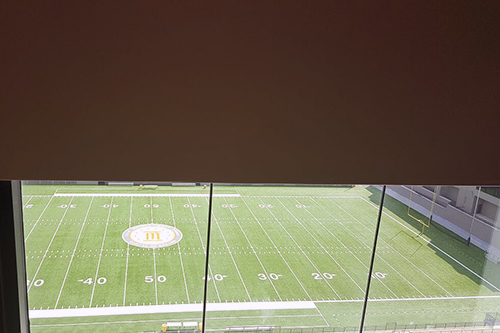 With the sun setting in the faces of those seated in the press box, installing blackout roll down shades was necessary and a perfect example of how blackout shades can solve many sun direction issues at your place of business, home or even a football field. 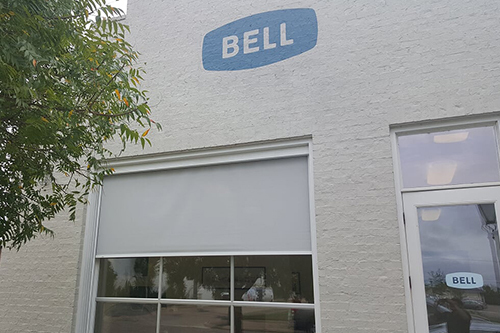 Due to the lack of space to mount a typical interior covering, exterior solar shades were used at the Bell Media and Tipping Point locations. 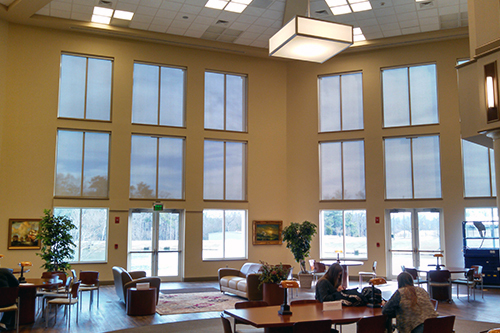 At the Colonial Properties, Lowder Construction and the YMCA offices interior solar shades were utilized. 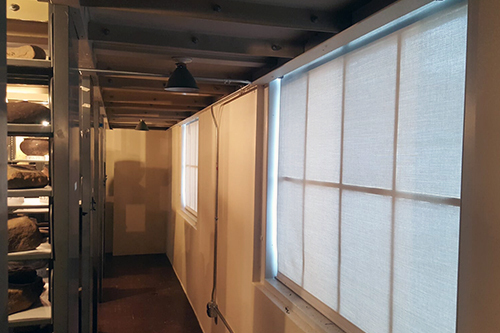 In addition, 2″ Faux Blinds for new Flats apartments were installed. The sun was so intense in this particular area of campus that students were filing complaints. Wallace Community College charged Just Blinds with finding a solution to this growing problem. We installed 3% solar screens to the windows and the problem was solved. When envisioning a government official’s office one pictures a room boasting distinguished decor and handsome finishings. Our installation of custom stained 3″ plantation shutters was a perfect addition to the Lt. Governor’s Office. The Chamber of Commerce’s new build called for a clean, professional solution for their conference room. Plantation shutters were the answer. 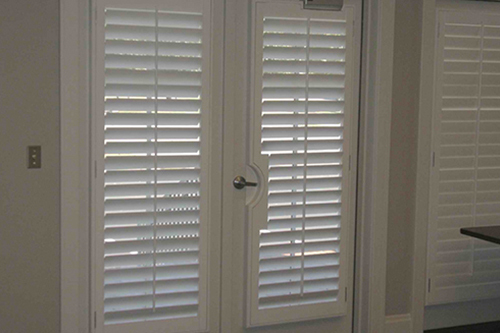 The room is filled with beautiful custom 3″ white plantation shutters on all windows and doors with windows. Law firms need protection from sun, but more importantly, they need privacy. We installed a unique custom solution that included a dual installation of Hunter Douglas roller shades, 5% solar shades and black out shades on The Vance Law Firm’s new building. 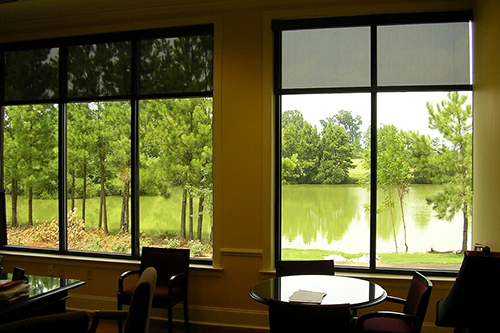 The solar shades decreased heat gain while the blackout shade provided the privacy that was needed during the evening hours. 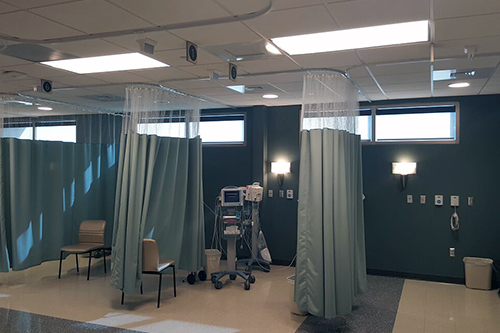 The recovery area at the Jackson Surgery Center was providing anything but a relaxing place post surgery – the sun was beaming in the patients eyes and inviting unwanted heat into the building. Just Blinds installed 5% solar shades to combat the heat. Just Blinds installs shades in cranes, too! This proved to be one of our most challenging installs. The wood yard operators were having a hard time seeing in the afternoon sun. 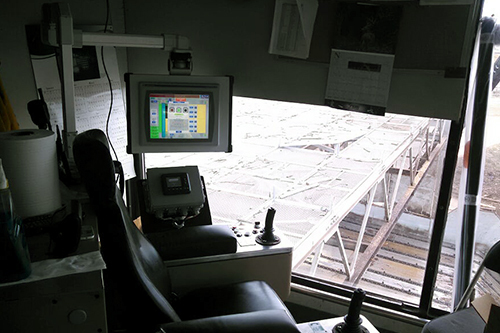 We installed solar shades in the P&H cranes and several control towers allowing for a more productive afternoon for workers. 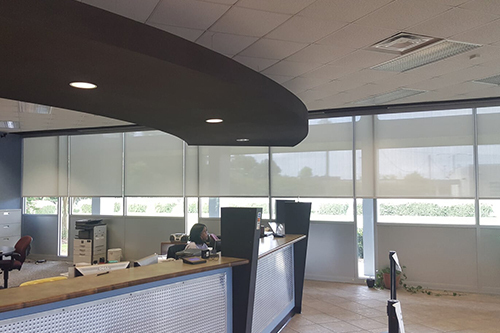 The Probate office was in need of a much needed window covering remodel at their busy location. We removed very aged vertical blinds and installed up to date 3% solar screens. Having tall, large windows overlooking a beautiful landscape lends to a wonderful work environment. However, that also can interfere with an employee’s ability to see their computer screen on sunny days. 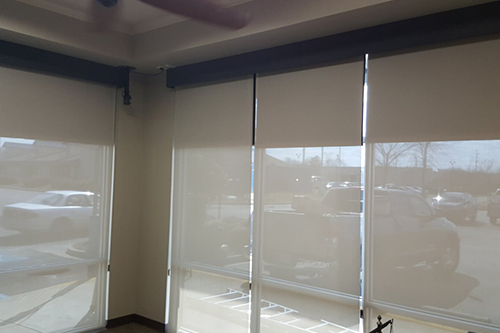 Installing roller shades made for a much more comfortable work environment – Employees are able to stay cool and see their screens at the same time. 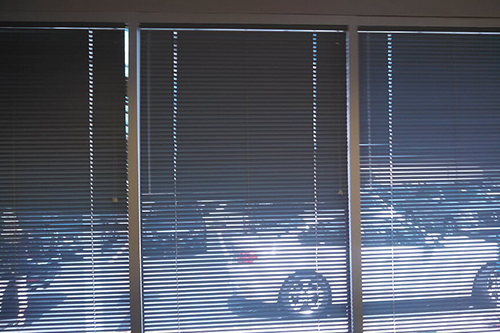 The Jack Ingrams Motors office received 1″ mini blinds. In addition, Just Blinds has also installed solar shades and mini blinds for both Nissan and Mercedes.